I have never met you. I have never felt you skin. I have never seen your face. Yet, loosing you seems like part of me is lost. I will never forget the dreams that I had with you. The dreams that I will not dare to dream anymore. 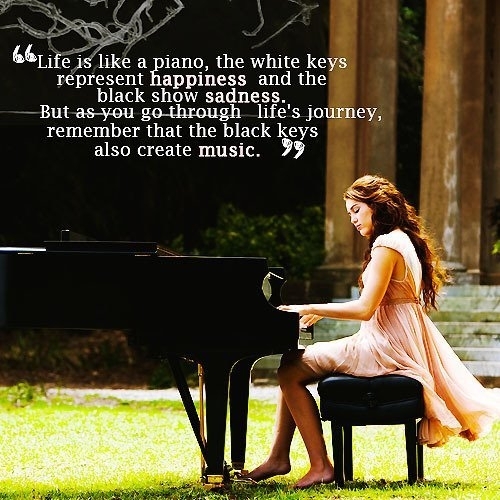 Some days may be like black keys, but sure there will be white ones. And those are the days that make worthwhile the journey of life. We must enjoy every day of our life. And hope that in the end the music that the piano of our life creates, is going to be a music that we will be proud of. Don’t be afraid of the suffering that may or may not come. Because in the end you will regret that you didn’t live life true to yourself and not the life that others expected of you. This is my contribution to Weekly writing challenge for WordPress community. Please share your post in comment if you are participating. The moment that you knew that you lost something or someone?! It’s difficult to describe that feeling. I felt that something inside my heart just broke down. Nothing will ever be the same again! I still feel that way when I think about that moment. How can I ever forget? If I could I would do something, anything at all just to go back in time. But I know one thing for sure: when something goes away, it will never come back. That makes me sad.